background-clip is one of those properties I've known about for years, but rarely used. Maybe just a couple of times as part of a solution to a Stack Overflow question. Until last year, when I started creating my huge collection of sliders. Some of the designs I chose to reproduce were a bit more complex and I only had one element available per slider, which happened to be an input element, meaning that I couldn't even use pseudo-elements on it. Even though that does work in certain browsers, the fact that it works is actually a bug and I didn't want to rely on that. All this meant I ended up using backgrounds, borders, and shadows a lot. I also learned a lot from doing that and this article shares some of those lessons. Before anything else, let's see what background-clip is and what it does. In the following image, we have an element's box model. 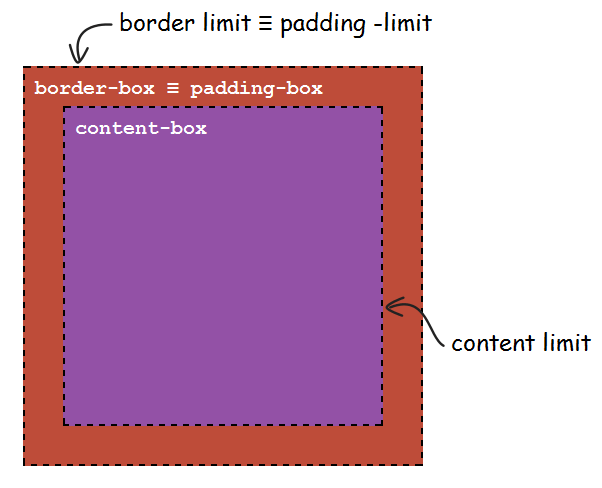 If the padding is 0, then the padding-box is exactly the same size as the content-box, and the content limit coincides with the padding limit. 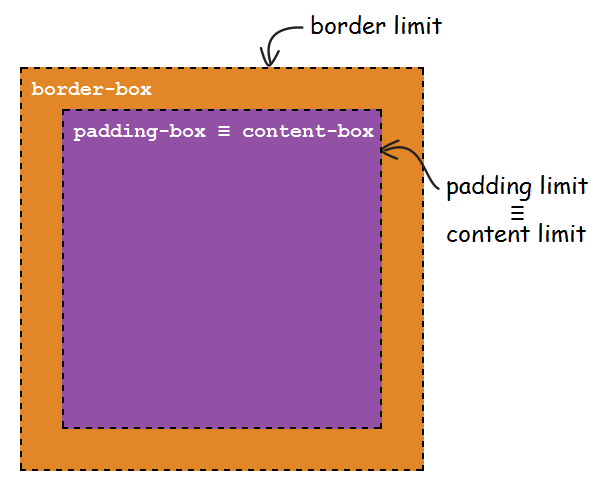 If the border-width is 0, the border-box is the same size as the padding-box, and the border limit coincides with the padding limit. 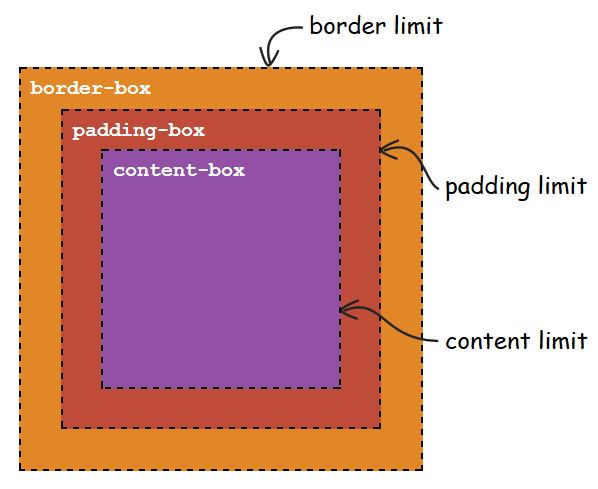 If both the padding and the border-width are 0, then all the three boxes (the content-box, the padding-box, and the border-box) have the same size, and the content limit, the padding limit, and the border limit all coincide. 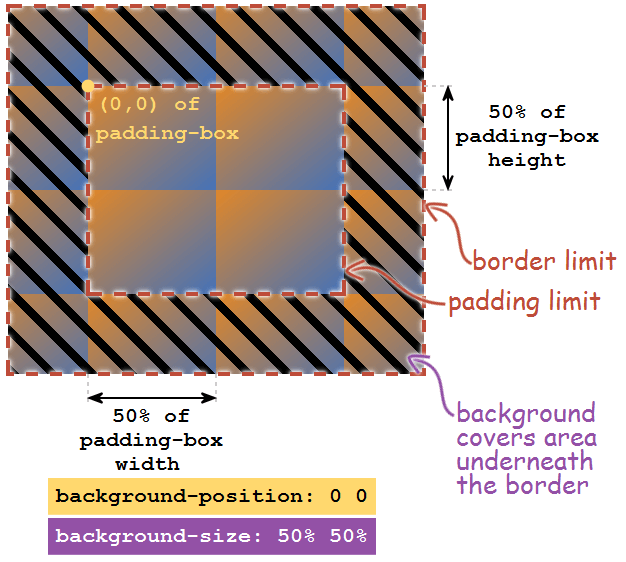 By default, backgrounds cover the entire border-box (they are applied underneath the border as well), but their background-position (and also %-based background-size) is relative to the padding-box. See the Pen default background-origin and background-clip (basic version) by CSS-Tricks (@css-tricks) on CodePen. In this demo, we can see that the gradient background covers the entire border-box (it's visible underneath the hashed border). We haven't specified a background-position, so it takes the default value — 0 0. We can see this is relative to the padding-box because it starts from the top left corner (the 0 0) of this box. We can also see that the background-size set in % is relative to the padding-box. When setting the background-size for a gradient (but not for actual images), we usually need two values for consistent results across browsers. If we use just one value, Firefox takes the second one to be 100% (per spec), while every other browser incorrectly takes the second value to be equal to the first. A missing background-size value is taken to be auto and since gradients have no intrinsic dimensions or intrinsic proportions, the auto value cannot be resolved from those, so it should get treated as 100%. So unless we want both dimensions of our background-size to be 100%, we should use two values. We can make the background cover just the padding-box or just the content-box with the help of background-clip. Clipping means cutting out and not displaying what falls outside the clipping region, where the clipping region is the area inside the dotted line in the illustration below. In the default case of background-clip: border-box, the clipping region is the border-box, so we have the background underneath the border as well. If we set background-clip: padding-box, the clipping region is the padding-box, meaning that the background is only displayed within the padding-box limit (it doesn't go underneath the border). And finally, if we have background-clip: content-box, the clipping region is the content-box, so the background is only displayed within the content-box limit. See the Pen backgrounds - helper demo #2 by CSS-Tricks (@css-tricks) on CodePen. We also have another property called background-origin that specifies which of the three boxes the background-position (and background-size, if expressed in %) is relative to. See the Pen backgrounds - helper demo #3 by CSS-Tricks (@css-tricks) on CodePen. The 100% 100% specified by the background-position of the actual image is the 100% 100% of the box specified by background-origin. At the same time, the 50% 50% specified by the background-size means half the width and half the height of the box specified by background-origin. In the background shorthand, background-origin and background-clip can be specified in this order at the end of the layer. Since they both take a box value, if just one box value is specified, then both are set to it. If two box values are specified, background-origin is set to the first and background-clip is set to the second. If no box values are specified, they just take the default values (padding-box for background-origin and border-box for background-clip). All right! Now let's see how we can use this to our advantage! Some may remember we can get semitransparent borders with background-clip. But, we can also introduce a space between the border and the area with a background without introducing an extra element. The simplest way to do this is to have a padding in addition to a border, and also set background-clip to content-box. By doing it in the shorthand with just one box value, we're also setting background-origin to content-box, but that's fine in this case, it doesn't have any unwanted effect. Clipping the background to content-box means it doesn't extend beyond the content limit. Beyond that, we have no background, so we can see what's underneath our element. 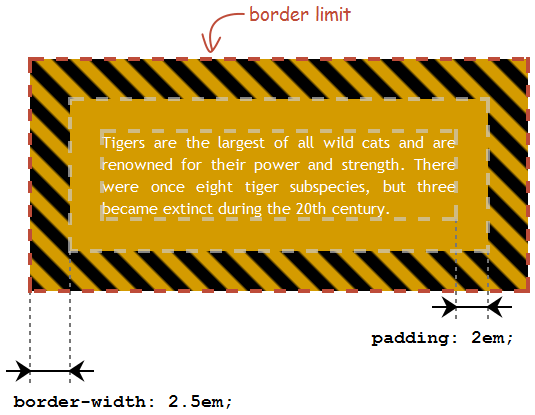 Adding a border means we see that border between the padding limit and the border limit. 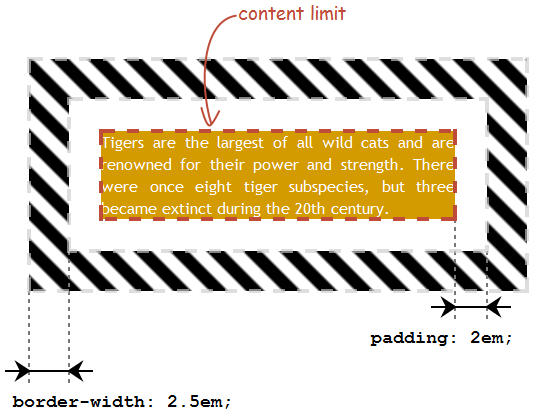 But, if the padding is non-zero, we still have a transparent area between the content limit and the padding limit. See the Pen space between border and background by Ana Tudor (@thebabydino) on CodePen. See the Pen space between border and background v2 by Ana Tudor (@thebabydino) on CodePen. Prefix reminder: I've seen a lot of resources adding -moz- and -ms- prefixes for CSS filters. Please, don't do that! CSS filters have been unprefixed in Firefox ever since they were first implemented (Firefox 34, autumn of 2014) and now they've landed in Edge behind a flag - also unprefixed! So CSS filters never needed the -moz- or -ms- prefixes, it's completely useless to add them, the only thing they do is bloat the stylesheet. We can also get a cool looking effect if we use a gradient for both the background-image and the border-image. We'll make a gradient that starts from a solid orange/red at the top, then fades down to complete transparency. Since only the shades are different and otherwise the gradients used are identical, we create a Sass function. See the Pen space between border and background v3 by Ana Tudor (@thebabydino) on CodePen. This approach of using the padding to create the space between the background and the border is not the best unless we only have a short text in the middle. If we have a lot more text... well, it looks crappy. See the Pen space between border and background v4 by Ana Tudor (@thebabydino) on CodePen. The problem is that the text starts right from the edge of the orange background and we cannot add a padding because we've already used it for the transparent gap. We could add an extra element... or we could use box-shadow! box-shadow can take 2, 3, or 4 length values. The first one is the x offset (determining how much to move the shadow to the right), the second one is the y offset (how much to move the shadow down), the third is the blur radius (determining how blurry the edge of the shadow is) and the fourth is the spread radius (determining how much the shadow expands in all directions). The following interactive demo allows playing with these values — click any of them and a popup with a slider shows up. 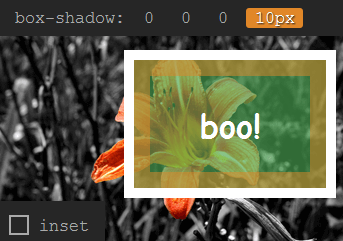 See the Pen how `box-shadow` works v2 by CSS-Tricks (@css-tricks) on CodePen. Note that, while the blur radius has to be always greater or equal to zero, the offsets and the spread radius can be negative. A negative offset simply moves the shadow in the negative direction of its axis (left or up). A negative spread radius means the shadow shrinks instead of expanding. Another important thing to notice here — because it's convenient for our use case — is that that the box-shadow is never visible underneath the space occupied by the border-box, not even when that space is (semi)transparent. If we keep the offsets and the blur radius to zero, but give the spread radius a positive value, then we get what looks like a second solid border of equal width in all directions, starting from the limit of the actual border and going outwards. Note that this kind of border doesn't necessarily need to have equal width in all directions. We can give it different border widths by tweaking the offset values and the spread radius, with the restriction that the sum of the widths of the horizontal borders equals the sum of the widths of the vertical borders. Using multiple shadows could help us get past this restriction if we don't need the border to be semitransparent, but this would be the kind of solution that complicates things instead of simplifying them. See the Pen space between border and background v5 by Ana Tudor (@thebabydino) on CodePen. Because we can have multiple box shadows, we can fake multiple borders this way. Let's take the case where we have two, one of them an inset one. If the actual border of the element is non-zero and transparent and the background-clip is set to padding-box, then we get a fake double border with a transparent area (the actual border area) between its inner and outer components. Note that this requires also increasing the padding to compensate for the space taken by the inset box-shadow. padding: 2em; // increased from 1em to 2em to compensate for inner "border"
See the Pen space between border and background v6 by Ana Tudor (@thebabydino) on CodePen. Let's say we want to get a target like the one below, with the restriction that we can only use one element and no pseudo-elements. So half the target would be 9 units, meaning the horizontal and vertical dimensions of the target are each 18 units. Our repeating radial gradient is black for the first unit, then transparent until the third unit, then black again and then transparent again... and this sounds like a repetition. Except we only have one unit from 0 to 1, the first time we have a black region, but then the second time we have a black region, it goes from 3 to 5 — that's two units! So... we shouldn't start from 0 there, but from -1 instead, right? Well, that should work, according to the spec. See the Pen repeating-radial-gradient for target by Ana Tudor (@thebabydino) on CodePen. The first problem here is that IE has a different opinion on how this should work. See the Pen radial-gradient for target by Ana Tudor (@thebabydino) on CodePen. 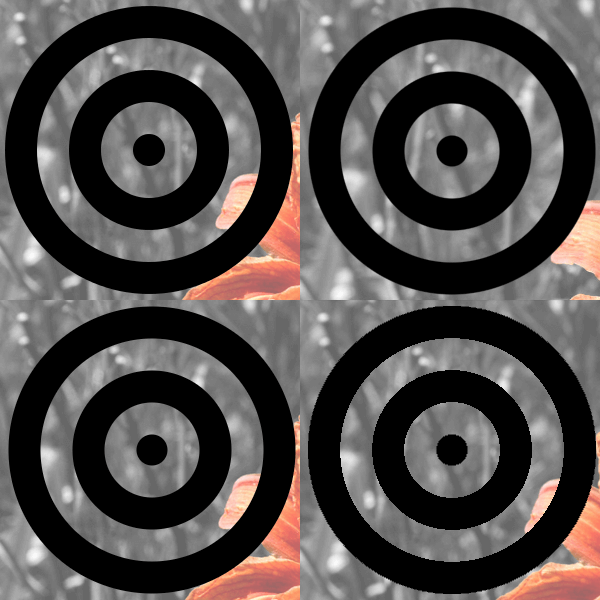 The circles are now distributed the same way in all browsers, but we still have another problem: the edges may not be as far from smooth as in the original image in IE/ Edge, but they look ugly in Firefox and Chrome! See the Pen radial-gradient for target v2 by Ana Tudor (@thebabydino) on CodePen. Well, this improves things in IE (where the result already looked good) and Firefox, but the edges still look ugly in Chrome. Maybe radial gradients are not the best solution after all. What if we were to adapt the background-clip and box-shadow solution from the previous section to this problem? We can use an outer box-shadow for the outer circle and an inset one for the inner circle. The space between them gets taken by a transparent border. 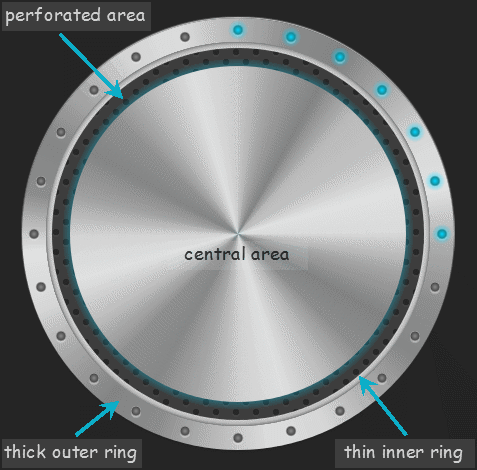 We also set background-clip to content-box and give the element enough padding so that we have a transparent area between the central disc and the inner circle. 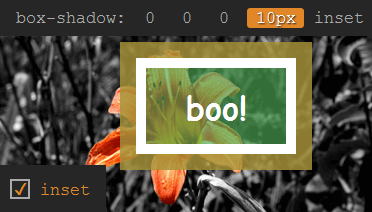 See the Pen CSS target with smooth edges by CSS-Tricks (@css-tricks) on CodePen. 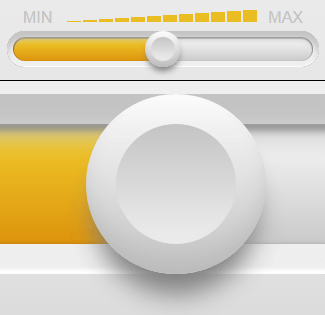 I first got this idea when trying to style a range input's thumb, track and, for non-WebKit browsers, progress (fill). Browsers provide pseudo-elements for these components. For the track, we have -webkit-slider-runnable-track, -moz-range-track and -ms-track. For the thumb, -webkit-slider-thumb, -moz-range-thumb and -ms-thumb. And for the progress/ fill, we have -moz-range-progress, -ms-fill-lower (both to the left of the thumb) and -ms-fill-upper (to the right of the thumb). WebKit browsers don't provide a pseudo-element that would allow styling the part before the thumb different from the part after. But let's go back to how we can style things. We can only add pseudo-elements to these components for Chrome/ Opera, which means that, in reproducing their look, we have to get as close as possible to it without relying on pseudo-elements. This leaves backgrounds, borders, shadows, filters on the thumb element itself. See the Pen soft plastic button (square) by Ana Tudor (@thebabydino) on CodePen. Except our control is round, not square. We'd just need to set border-radius: 50% on it then, right? Well... that doesn't work because we're using border-image, which makes border-radius be ignored on the element itself, though, funny enough, it still gets applied on the box-shadow, if there is one. What should we do then? Well, use background-clip! We first give the element a non-zero padding, no border and make it round with border-radius: 50%. Then we layer two gradient backgrounds, the top one being restricted to the content-box (note the clipping is being applied as part of the background shorthand). Finally, we add two box shadows, the first one being a dark one that creates the shadow underneath the control and the second being an inset one, that should darken a bit the bottom and laterals of the control's outer part. See the Pen soft plastic button (really round!) by Ana Tudor (@thebabydino) on CodePen. This looks pretty similar to the previous case, except now we have a lighter line at the top and an inset shadow for the middle part. 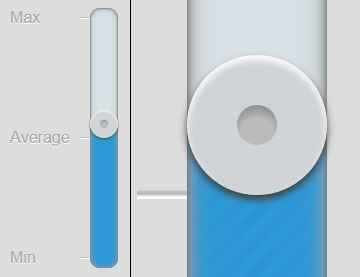 If we use an outer box-shadow to create the lighter line, the whole thing wouldn't be round anymore unless we also decrease its height to compensate for the shadow. That would mean we need to do more computations to determine the position of the inner part. If we use an inset one instead, then we can't use that for the dark shadow of the inner part. However, we could emulate that with a radial-gradient that gets conveniently sized, positioned, and clipped to the content-box. This means the same strategy as in the previous case, except we have an extra radial-gradient layered on top of the other backgrounds. The actual background-size of the radial gradient is larger than the content-box so we can shift it down without bringing its top edge within the content limit. See the Pen matte button by Ana Tudor (@thebabydino) on CodePen. This one is a bit more complex and requires that the three boxes (the content-box, the padding-box, and the border-box) are all different, so that we can layer backgrounds and use background-clip to get the desired effect. See the Pen 3D button by Ana Tudor (@thebabydino) on CodePen. See the Pen 3D button #2 by Ana Tudor (@thebabydino) on CodePen. We might be able to get even closer to what we want with better chosen shades, extra radial gradients, or even using background-blend-mode, but I don't have the artistic sense needed for something like that. See the Pen 3D button #3 by Ana Tudor (@thebabydino) on CodePen. For the actual slider thumb, I used the same thumb background with the radial gradients on top everywhere, and added the pseudo for Blink right on top of the radial gradients. This is because thumb slider styles in Safari get applied via ::-webkit-slider-thumb, but Safari doesn't support pseudo-elements on the thumb (or track). So if I were to remove the fallback from the styles applied to ::-webkit-slider-thumb, then Safari wouldn't display the round part at all. Just like before, we do this by giving the element a non-zero transparent border, a padding, and layering backgrounds with different background-clip values (remember that those with content-box values need to be on top of those with padding-box values, which need to be on top of those with border-box values). In this case, we have a lighter linear-gradient to cover the border area, a darker one plus a couple of radial ones which we make smaller and non-repeating to darken the ends even further for the padding area, and a really dark one for the content area. Then we give this a border-radius equal to at least half the height of the content area plus twice the padding and twice the border. We also add an inset box-shadow to subtly highlight the padding limit. See the Pen illusion of depth by Ana Tudor (@thebabydino) on CodePen. Due to the way border-radius works — the radius for the content area being the one we specify minus the border-width minus the padding, which ends up being negative — there is no rounding for the corners of the content area. Well, we can fix this! We can emulate the shape we want by using both linear and radial gradients for the content area. The way we do this is by first making sure the width of our content area is a multiple of its height (in our case, 15.75em = 9*1.75em). We first layer a non-repeating linear-gradient positioned in the middle that covers the entire height of the content area vertically, but leaves a space of half the content area height at both the left and the right ends. On top of this we add a radial-gradient with a background-size equal to the content area height both horizontally and vertically. See the Pen illusion of depth #2 by Ana Tudor (@thebabydino) on CodePen. It doesn't look like anything yet and that's because the entire look is achieved with the help of just two properties we haven't added in yet: box-shadow and background. See the Pen metallic control - step 0 by Ana Tudor (@thebabydino) on CodePen. See the Pen metallic control - step 1 by Ana Tudor (@thebabydino) on CodePen. Now we have to layer three types of backgrounds, from top to bottom: limited to the content-box (creating the central area), limited to the padding-box (creating the perforated area and cyan glow) and limited to the border-box (creating the thick outer ring and LEDs). We start with the central area, where we have some discrete circular lines created with three repeating radial gradients stacked one on top of the other, with the values of the stops based on the cicada principle and conic reflections created with a conic gradient. Note that conic gradients are not yet supported in any browser so we need to use a polyfill at this point. Now this is finally starting to look like something! See the Pen metallic control - step 2 by Ana Tudor (@thebabydino) on CodePen. We move on to the perforated area. The cyan glow is just a radial gradient to transparency in the outer part, while the perforations are based on the Carbon fibre pattern from the gallery Lea Verou put together some five years ago - still damn useful for artistically challenged people such as myself. See the Pen metallic control - step 3 by Ana Tudor (@thebabydino) on CodePen. We now have a metallic control! See the Pen metallic control - step 4 by Ana Tudor (@thebabydino) on CodePen. It has no LEDs at this point, so let's fix that! Every LED is made up of two non-repeating radial gradients stacked one on top of the other. The top one is the actual LED, while the bottom one, slightly offset vertically, creates the lighter highlight in the lower part of the LED. It's pretty much the same effect used for the holes in the perforated area. The bottom gradient is always the same, but the top one differs depending on whether the LEDs are on or off. We take the LEDs to be on up to the $k-th one. So up to the point we use the cyan variation for the top gradient, while after that we use the grey one. We have 24 LEDs that are positioned on a circle passing through the middle of its border area. So its radius is the radius of the control minus half the border width. 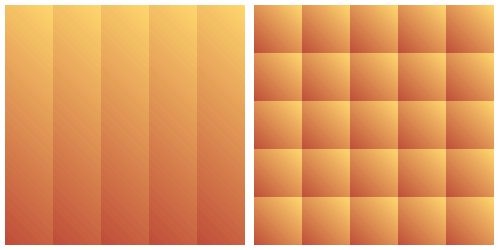 We generate all these gradients with Sass. We first create an empty list of gradients, then we loop and, for every iteration, we add two gradients to the list. Their positions are computed so they're on the previously mentioned circle. 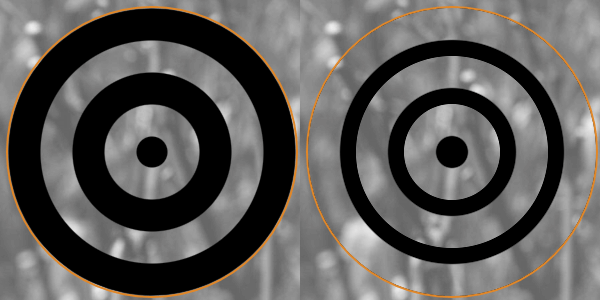 The first gradient depends on the loop index, while the second one is always the same (only at another position on the circle). See the Pen 1 element (no pseudos) metallic control by Ana Tudor (@thebabydino) on CodePen. What we want is to recreate this effect using just one element and no pseudo-elements. Layering backgrounds with different background-clip and background-origin values does the trick in this case as well. We create the actual button with two backgrounds, the one on top clipped to the content-box and the one under it clipped to the padding-box and use a radial-gradient() background with background-clip and background-origin set to border-box to create the shadow. We give it a thickish transparent border all around, so that we have enough space to recreate that shadow in the bottom border area. 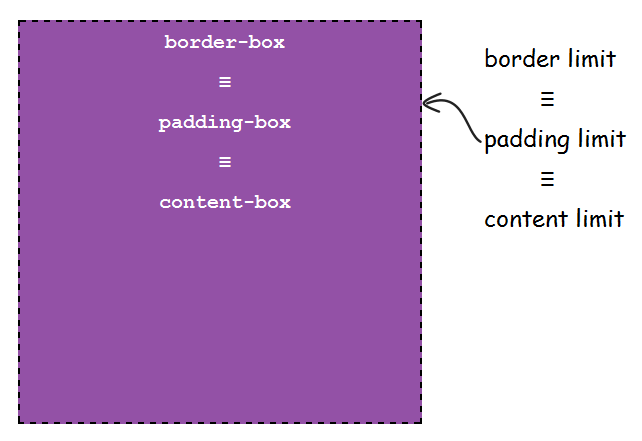 We do this for all borders, not just for the bottom one because we want the same kind of symmetrical rounding for all the corners of the padding-box (if you need a refresher of how this works, check out Lea Verou's excellent border-radius talk). 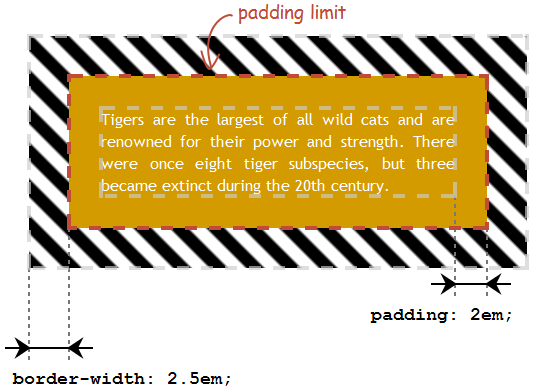 See the Pen border-width & padding-box corner rounding by Ana Tudor (@thebabydino) on CodePen. The first background from the top is a conic-gradient() one to create the conic metal reflections. This one is clipped to the content-box. Right underneath it, we have a simple linear-gradient() clipped to the padding-box. We use three inset box shadows to make this second background less flat - add another shade all around with a zero blur, positive spread shadow, make it lighter at the top with a semitransparent white shadow and darker at the bottom with a semitransparent black shadow. 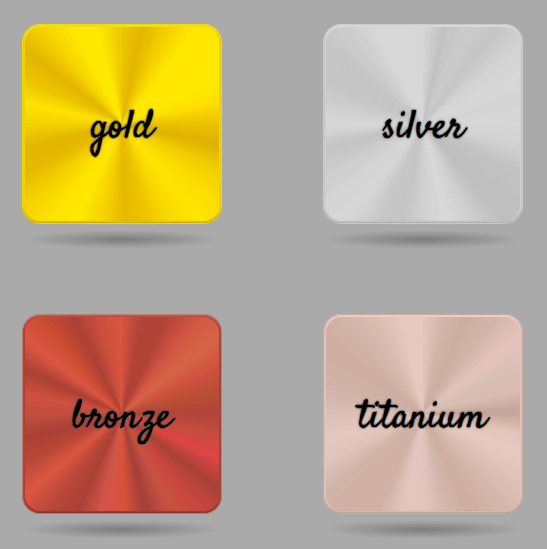 See the Pen metallic button - no shadow by Ana Tudor (@thebabydino) on CodePen. For the shadow, layer a third background for which we set both background-clip and background-origin to border-box. 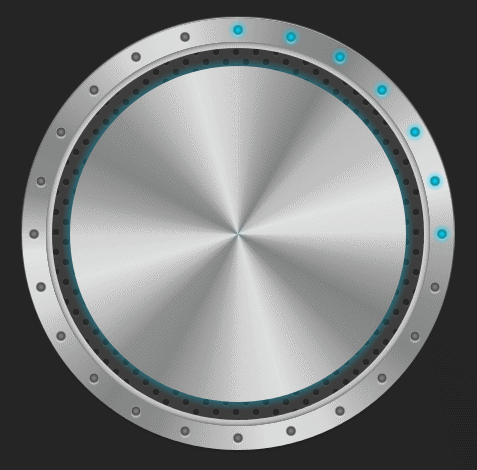 This background is a non-repeating radial-gradient() whose position we attach to the bottom (and horizontally in the middle) and which we shrink vertically so that it fits into that bottom border area and even leaves a bit of space - so we take it for example to be something like .75 of the border-width. See the Pen metallic buttons with shadow (no pseudos) by Ana Tudor (@thebabydino) on CodePen. Background-clip certainly has its use cases! Particularly when layering multiple effects around the edges of elements. Man, I couldn’t think of any good use cases until you provided all those examples. Those examples look amazing! Appreciate the work done here but doesn’t the whole thing become so complicated which makes more sense to use SVG instead? Yeah, and isn’t skeuomorphic design already dead? @Kyriakos: Interesting question. 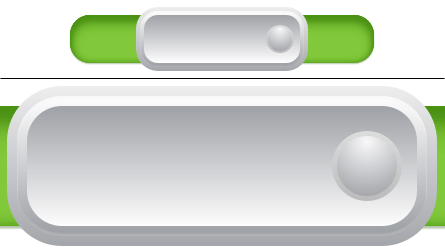 I just did an SVG version of one of the buttons just to see how it feels and I personally found it more complicated. I may not be as comfortable with SVG gradients and filters as I am with CSS, but I’m pretty sure you can’t do an accurate SVG version with less code than the CSS one. Mine has more than twice the code. Maybe someone who is better when it comes to SVG could shrink it a bit, but I doubt it could be made smaller than the CSS one. @AOK: That I cannot answer. I have no idea what the ske-whatever-you-spell-that-thing means. I’ve heard people using it and explaining it to me, but I just don’t get it. Not even sure I understand what “design” means, though I use it to describe “something drawn by someone else that I have coded/ intend to try to code”. It depends on the usage. For styling input controls, this is a far better approach using native elements than SVG. @Ana – skeuomorphic design refers to design (typically user interface) elements that retain visual cues that were necessary in the original thing that is being mocked. For instance, your soft plastic control is skeuomorphic because it is mimicking a real world soft plastic control by using shadows and gradients. They all look great by the way, I really enjoyed reading through this and I’m impressed with what you do using CSS! @AOK – I don’t think skeuomorphic design is “dead”. It’s just not what’s the trend anymore. It will always have it’s place and I don’t think it will ever “die”. Wonderful work. Thank you, Ana. Really loved this article. Got me thinking of some new strategies. I also may have drooled on my keyboard while looking at your sliders. WOW! This is some serious CSShit!! Impressive, article! You’re like a CSS wizard… whatever that may be.